We were glad that we were able to get on either the SuperCat or FastCat for our return trip to Batangas after a meeting in Calapan. For one, this meant that our travel will only be an hour, 1.5 hours less than a trip on a regular RORO ferry. The RORO ferry schedule also didn’t favor an early arrival in Batangas considering we also had to travel back to Metro Manila. The SuperCat staff earlier didn’t sell us tickets because they were not sure there would be SuperCat trip in the afternoon given the conditions at sea. SuperCat staff had to assist passengers as they boarded the vessel due to the rough waters that frequently lifted the vessel and make one lose his/her balance. Another photo showing staff assisting boarding passengers. Each passenger had to go one at a time and at intervals due to the movements of the docked vessel. Inside the craft, it was obvious that this was a much better vessel than the regular RORO ferries plying the same Calapan-Batangas route. The seats were more comfy and the interior was clean and obviously well-maintained, and that includes the toilets on the vessel. There was airconditioning and staff were more professional and attentive to passengers (probably taking after airline flight attendants). There were few passengers so some people had entire rows to themselves. Passengers may place their bags or things under their seats or in front of them as there were no overhead compartments or space for stowing luggage and other items. Passengers with no one beside them put their bags on the empty seats instead. The crew served us some simple snack comprising of peanuts, a cupcake and a fruit drink. There were items like sandwiches, junk food and other drinks available at the bar inside the SuperCat but choices were limited and I learned their stocks were already depleted as this was the last trip for the day for the SuperCat. There were no night time fast craft trips. I tried to get photo of what was showing on the television screen but the choppy waters combined with the dim lighting didn’t favor my BlackBerry’s camera. There was only one screen and it’s size is obviously not suitable for passengers seated farther from the front. It didn’t really matter because it was only a 1-hour trip between Calapan and Batangas when using the SuperCat. Dim lights as passengers disembark from the fast craft. Outside, crewmen assisted passengers who might lose their balance due to the instability of the vessel due to the rough waters. It was already drizzling when we got out of the terminal and rain was pouring as we drove out of Batangas and unto the STAR tollway. NAIA’s Terminal 1 recently reclaimed the unenviable title of worst airport in the world. While I have seen worse airports in the country, NAIA happens to be the country’s main gateway to the world. Thus, there are a lot of expectations regarding the airport including the facilities and most importantly, the quality of services provided to passengers at the terminals. Just this week, NAIA’s radar had to go through maintenance works and it was shut down for a few days. The shutdown meant air traffic had to be managed manually. The result was quite disastrous to airlines schedules and a lot of flights were delayed or cancelled, thereby costing a lot of people a lot of money. One feature of international airport terminals are the shops. Most major terminals would have the typical duty free shops selling chocolates, alcohol, and luxury brand items. Many terminals would have shops selling specific merchandise or local products that are popular or associated for that country like electronics, jewelry, fabrics and various crafts. Local crafts are stuff that foreign travelers would probably look for in airports especially for last minute souvenir shopping. If the price is reasonable, then I would assume that such products will sell quite decently at airports. In the case of NAIA, there are more handicrafts stores at Terminal 1, which serves most international airlines flying to Manila. The larger handicrafts stores are located at the end of the corridor in between the entrances to the two main wings of the terminal and are featured in this post. Arts and handicrafts stores sell mainly local or Philippine-made goods. I say mainly because I’ve seen souvenirs like miniature or toy jeepneys and tricycles that are actually made in China. Souvenir shops are mostly open early in the morning except a few like this curiously named “Multi-gift” boutique. 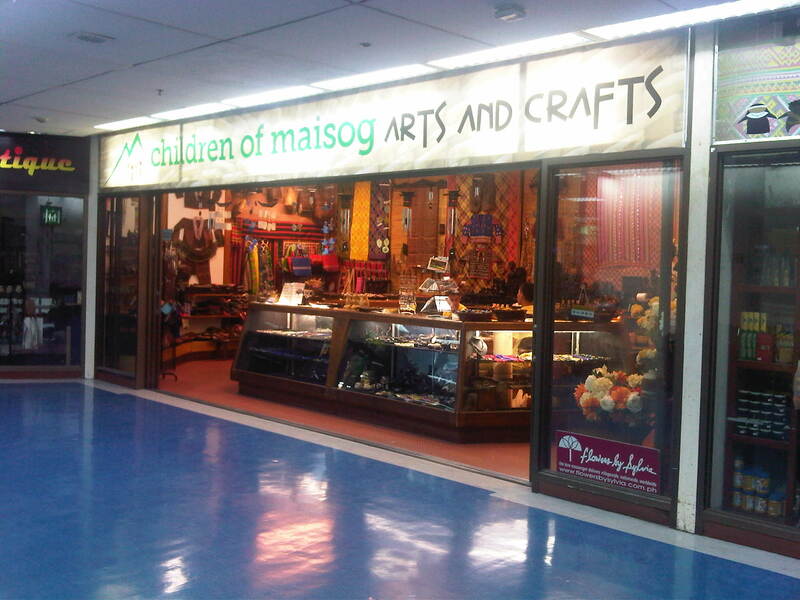 I like this shop “Children of Maisog arts and crafts.” I think their products are authentic and of high quality. Also, and perhaps most importantly, the prices are not pang-airport or pang-turista (for tourists). They are comparable to those in the malls or even some trade fairs. 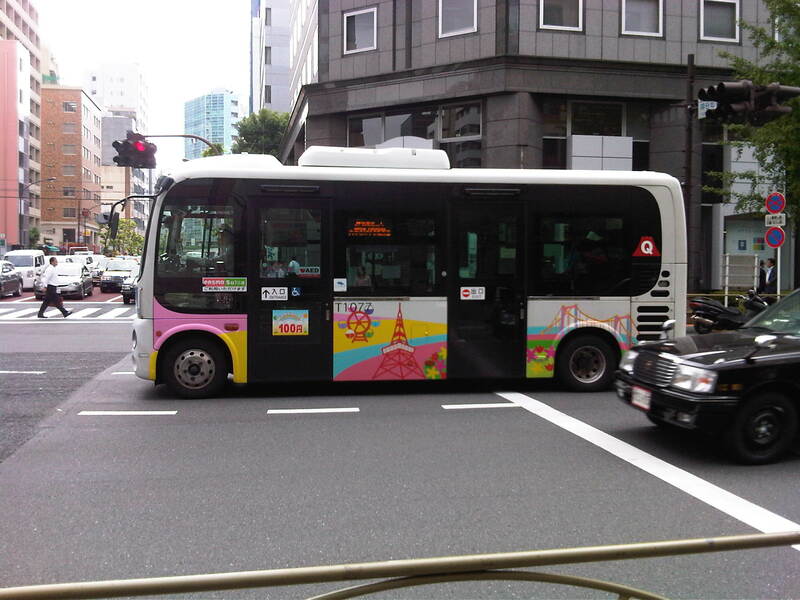 Walking to our meeting venue, I saw this small bus stopped at an intersection. I remembered a similar bus that we rode between the JR Shibuya Station and the Philippine Embassy in Nanpeidai (in the Shibuya District) in the late 1990s. The mini-bus is a form of paratransit that’s right there with the jitneys and van services that provide mainly short distance public transport services in, among others, city centers and residential areas. The fare is fixed at 100 JPY and you can use your Suica or Pasmo card to pay your fare. Something like this could be suitable for CBDs in the Philippines including the Makati CBD, Ortigas CBD and maybe the future Quezon City CBD that is being developed in the north triangle area of that city. Other city centers where this mini-bus can be used are those in Cebu, Davao, Iloilo and Bacolod. Perhaps most desirable are low emission versions of this vehicle including, if available, electric buses. At present, Makati has electric jeepneys plying 3 routes along city roads in the Makati CBD. These will complement regular bus or rail services and should replace jeepneys along specific routes. There are three bills currently being discussed at the Senate that were filed by Sen. Ralph Recto. These propose the restructuring of the special funds derived from the Motor Vehicle Users’ Charge (MVUC) in order to allocate funds for mass transportation. Senate Bill 446 – An Act Creating The Special Mass Transit System Support Fund, Reallocating The Disposition of Monies Collected From The Motor Vehicle User’s Charge, Amending For The Purpose Sections 7 And 8 Of Republic Act No. 8794, Otherwise Known As The Motor Vehicle User’s Charge Act of 2000. Senate Bill 611 – An Act Creating The Special Mass Transit System Support Fund To Provide Additional And Long-Term Funding To Priority Mass Transit Projects In The Greater Metro Manila Area, Amending For The Purpose Sections 7 And 8 Of Republic Act No. 8794, Otherwise Known As The Motor Vehicle User’s Charge Act of 2000. Senate Bill 621 – An Act Creating The Special Mass Transit System Support Fund Amending For The Purpose Sections 7 And 8 Of Republic Act No. 8794, Otherwise Known As The Motor Vehicle User’s Charge Act of 2000. The Senate Committee on Public Works held a public hearing last October 17, 2013 at the Lorenzo Tanada Room at the Senate. The NCTS Director, Dr. Hilario Sean O. Palmiano, was invited as a resource person for the hearing and joined representatives of agencies such as the DPWH, DBM, DOF, LTO and the Road Board in providing insights and comments on the proposed bills. The same agencies were also requested to provide pertinent data for the committee to evaluate the proposed changes to R.A. 8794. Such data include information on past disbursements and approved projects that used the special funds under the MVUC. The earthquakes that affected mainly the provinces of Bohol and Cebu in central Philippines this morning reminds us of the need to be more prepared for such natural occurring calamities that are practically unpredictable. I like what the Phivolcs Director Renato Solidum stated about the need to check design, materials and construction workmanship for structures in order to have these built in compliance with structural engineering guidelines covering seismic design. These apply also to transport infrastructure like roads, bridges, airports and ports. These are important for relief operations as accessibility is critical to mitigate impacts of disasters. I post the photos of some of the heritage churches we were able to visit during travels to Bohol in 2008 and 2012 as a reminder of sorts of what we probably have lost in terms of cultural heritage assuming we are unable to restore these structures to their old forms. Perhaps the local (and national) chapters of architects (UAP) and civil engineers (PICE) should pitch in to make sure restoration work will be undertaken with care and of the highest quality. .There are many heritage structures around the country and in the nearby islands of Panay and Negros alone, there are many examples of these that need to be assessed and perhaps fortified in the likely occurrence of a powerful quake in the future. In addition, the damaged roads and bridges and the landslides that have blocked many roads reminds us of the need for more disaster resilient transport infrastructure. Resilience may also mean the provision of redundant infrastructure to ensure alternate routes for relief operations. Abstract: The urban drive cycles for five different light duty vehicles (LDV) are developed in this study. Furthermore, the fuel consumption factors for each of the type of LDV are estimated. The study presents the methodology in the development of the drive cycles in which the speed profile of the specific type of vehicle is surveyed, downloaded and processed. In the survey of speed data, a Global Positioning System (GPS) device is used as an on-board instrument. The GPS device is placed on the dashboard of every surveyed vehicle and it recorded instantaneous speed in its memory. The speed data is downloaded from the device using software provided by the maker of the device (Garmin) called Mapsource. The speed data is processed using a program to execute the methodology in generating candidate drive cycles. The program creates drive cycles by randomly appending microtrips to form a minimum of twenty minute speed time profile. Furthermore, along with the generated drive cycle, the program also indicated how it compared with the target drive cycle by computing their individual absolute value difference of their joint speed-acceleration probability distribution. Ten drive cycles for each type of LDV are developed which have absolute value differences less than 20%. The final drive cycle is selected from the ten (10) candidate drive cycle developed from each type of LDV. The selected drive cycles are then used in the Vehicle Research and Testing Laboratory at UP College of Engineering, Mechanical Engineering Department, to estimate the fuel consumption factors of each type of light duty vehicle considered. The developed drive cycles for the different types of light duty vehicles, namely (1) private cars, (2) taxicabs, (3) public utility jeepneys, (4) asian utility vehicles express, and (5) light cargo vehicles have average speeds of 17.97 kph, 13.57 kph, 10.87 kph, 14.69kph and 8.43 kph respectively. The fuel consumption factors estimated for all the light duty vehicles tested in the chassis dynamometer laboratory ranges from 9 to 12 km/liter. Abstract: Traditional method in estimating roundabout capacities using gap acceptance theory involves the assumption that vehicles entering the roundabouts give way to vehicles running along the circulatory road. Parameters usually used include the critical gap and the follow up times used by the entry vehicles. Gap forcing persists in local roundabouts and this common Filipino driver behaviour renders the existing models derived from traditional assumptions unsuitable for local applications. The study embarks on the development of the simulation model which takes into account gap forcing in the estimation of capacity of roundabouts in the Philippines. It explores the feasibility of introducing more realistic driver behaviour assumptions and the inclusion of additional parameters to come up with a model suitable for local use. Earlier, I featured some conveniences at train stations that included vending machines on the platforms. Following are a few more photos including a couple showing the newest models of vending machines. These have touch screens showing the products for sale and even shows weather forecasts. Passengers using the new touch screen vending machines at a JR Line platform. The screen displays products as well as the weather forecast. On the right are disposal bins for bottles and cans. Conventional vending machines and trash bins at the Enoshima Dentetsu platform. A souvenir machine featuring a metal press where the customer can choose among 3 designs.